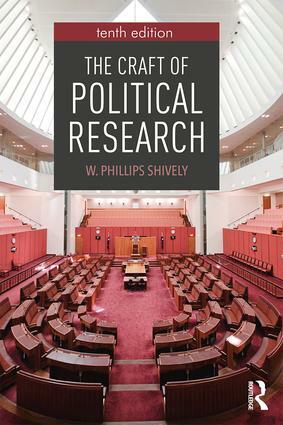 The Craft of Political Research is a non-technical introduction to research design and analysis in political science, emphasizing the choices we make when we design a research project and analyze its results. The book’s approach centers on asking an interesting research question, and then designing inquiry into the question so as to eliminate as many alternative explanations as possible. How do we develop theory, and what constitutes a good research question? How do we develop measures and gather evidence to answer a question? How do we analyze our findings? Students will be introduced to such topics as multidimensional concepts, levels of measurement, validity, reliability, random and non-random measurement error, sampling, case selection, causality, experimental and quasi-experimental design, statistical inference, and regression and correlation analysis. Throughout, the emphasis is on understanding the "back story" of analysis — why do we measure in a particular way, why do we choose one design as against another, why do we conduct our analysis as we do. Emphasizing the internal logic of research methods and the collaborative nature of the research process, the greatest strength of the book is its clarity and the large range of political science examples it provides. It works at a conceptual level, seeking an understanding of the principles that underlie techniques and the reasons that we choose them. Updated and international examples from the US, UK, Latin America and China amongst others, and international organizations such as the World Bank and the United Nations. New section, "Gathering Accurate Information" reviews published sources of data, such as UNESCO, and offers advice about how to use such sources. It advises students on how to gather data in personal interviews and it acquaints them with publicly available data sets for secondary analysis. Online material featuring revised learning objectives for each chapter, and a new section offering projects and questions for each chapter.